In older versions of RealPlayer, the details view shows the formats and settings compatible with your device. Video Details controls settings for video files. Format controls the file type. Only file types that play on the chosen device are available. Quality defines the level of detail in the video, which directly affects the size of the output file. The Automatic setting maintains the quality level of the source file. Choosing high quality results in a larger file. Choosing low quality results in a less detailed photo, and a smaller file. Resolution is the width and height of the video photo. The Automatic setting is recommended if you are not sure which resolution to choose. Otherwise, set this to match the resolution of the display you will be viewing the video on (in the case of portable or small screen devices), or to be the same or similar to the input file (in the case of larger screen devices). Audio Details controls settings for audio files only. 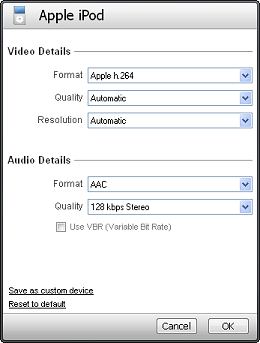 It does not control the audio portion of video files. Quality controls the amount of sound detail in the output file. The default setting is at a medium level. The available choices vary by file type. In general, choosing from the top of the list will result in better sound, and a larger file. Choosing from the bottom of the list will result in lower quality sound, and a smaller file. To preserve all of the sound information, choose RealAudio Lossless or WAV when available. Lossless files preserve sound quality while still reducing file size. WAV files are uncompressed and have a large file size. Use VBR (Variable Bit Rate) is available only if the file type supports it. VBR gives more storage space to complex portions of the file, and less storage space to simple portions of the file. This can create smaller file sizes with no perceptible drop in sound quality. VBR files may not play well on some older devices. Save as custom device allows you to create customized device profiles based on any device profile. When you next choose "Select Another Device", your new device profile will appear under "My Custom Devices". Reset to default returns the device settings to the defaults. This is important because changes you make will remain until you choose to change them, even if you restart RealTimes.